Riga is a beautiful, historical city. And it’s also an affordable European capital. For the price of a dorm bed in Paris, London or Amsterdam in Riga you can already get a hotel room. For about 40 – 60 EUR a night in Riga you can get a nice hotel room. But 100 – 120 EUR in Riga buys you a fancy double room in most of the best hotels in Riga, mostly very close to the city center or even in the old town. Whether it’s an inexpensive room for your week-long stay in Riga with a family or you want to splurge a bit going on a luxurious and relaxing weekend getaway, Riga has it all. And the choice is very wide. To make things easier for you I went to booking.com, filtered out all the best hotels in Riga, both cheap and luxury. And then I went through this list to choose best of the best, taking into account user rating, reviews and location of the hotel. And here is the result! With cheap and mid-range hotels first, and luxury hotels – at the end of the article. 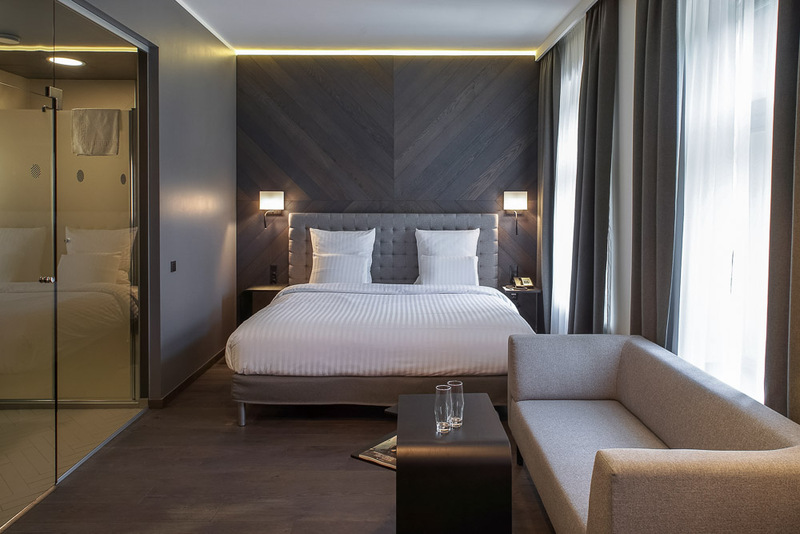 Located in the center of Riga, just 100 meters away from the famous Alberta street, Mosaic Hotel is a great choice for everyone, who doesn’t want to overpay. Riga Old Town is 10 minute walk away. 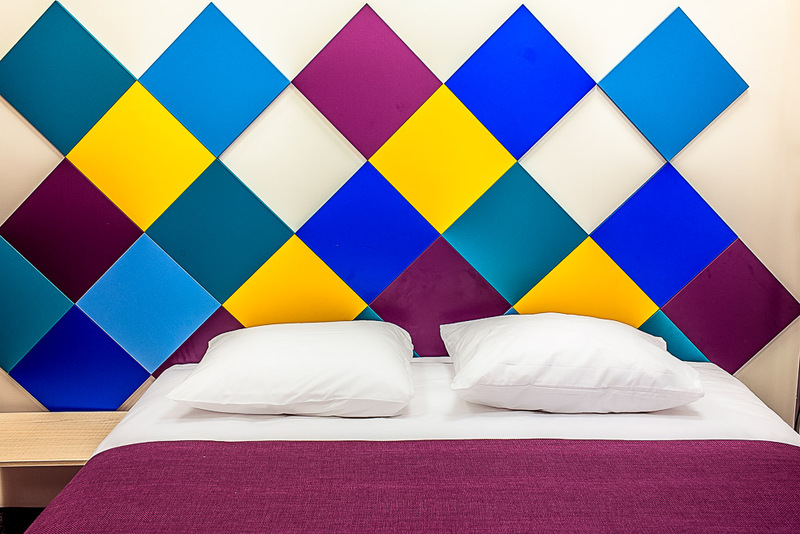 Rooms at Mosaic Hotel are simple, yet stylish and beautifully decorated. And also perfectly clean, as we can judge from the user reviews online, which isn’t less important. Note, that some of the cheapest rooms don’t have an attached bathroom and toilet, meaning that you will be sharing them with some other guests. In the common area there is a TV, microwave, electric kettle, sink, fridge and few tables. Free Wi-Fi is available in all rooms. Only 15 minute walk away from the old town and central train and bus station Riverside Hotel is another great choice for those traveling on a budget. It’s a 3-star hotel with sauna and jacuzzi. All rooms at Riverside come with free Wi-Fi, attached bathroom and bathroom floor heating. And there is also a table and a chair in every room. Useful if you want to work there, for example. Add just a little bit extra, take a Classic Suite and you’ll get a hot tub as well. Still for a price of 2 dorm beds in more expensive European capitals. Sounds like a great deal? 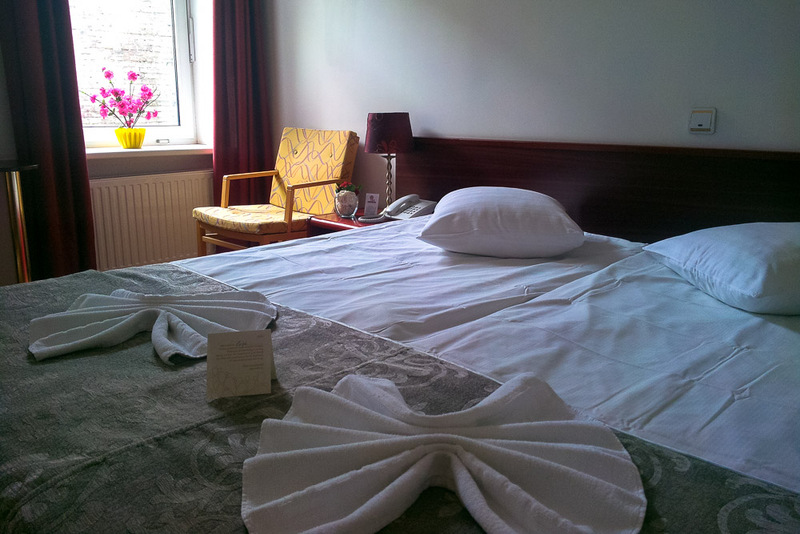 Located less than a mile (1 kilometer) away from the Riga Old Town Knights Court offers nice rooms for a bargain. Cheapest rooms at Kights Court come with a shared bathroom, meaning you’ll have to share it with other guests. But all the rooms with an attached bathroom features a shower and a hairdryer. Free Wi-Fi is available in all of the rooms. And there is a table and a chair in every room. Are you looking for things to do in Riga? Check out these tours and this list of activities! A really nice 3-star hotel with overall rating of 8+, only 1 mile (1.6 kilometers) away from the old town. 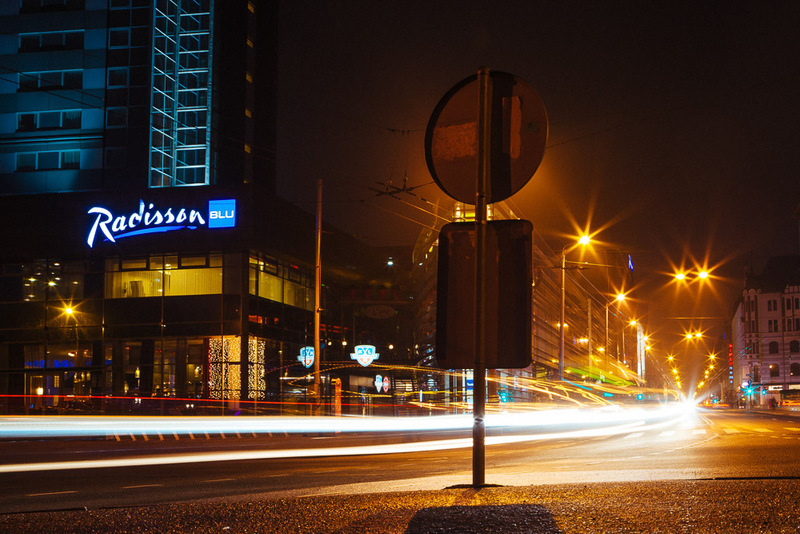 It’s still Riga city center, and you’ll definitely feel safe walking there even at nights. All rooms at Hotel Tia are with a private, attached bathroom. And there is a hairdryer. In all of the rooms you’ll find a TV, safe and minibar. Free Wi-Fi is available throughout the hotel. And breakfast is included in price for all of the guests, and it’s being served in the hotel’s restaurant. They have a bar at Tia, too. If it’s some sports event or a concert, that you are traveling for to Riga, you’ll probably like the fact, that this hotel is very close to the Arena Riga (a place where that event most probably is happening). Located 10 minute walk away from the Riga Old Town it’s an easy to find 3-star hotel in a local neighborhood. All of the rooms at A1 Hotel feature an attached bathroom. There is a bar and a billiard room in the hotel. Free W-Fi is available throughout the property. If you are making a booking on booking.com and if you wish to have a breakfast at hotel, make sure to choose the right option! It’s a non-smoking hotel. An affordable 4-star hotel located in the Riga city center. One of my personal favorites among the best hotels in Riga. Similar to many other of the best cheap hotels in Riga it’s only a short walk away from the Riga Old Town. Though, it has a slightly better location than few others I have already mentioned higher. It’s next to Riga Embassy District. And the famous Alberta street, known for its Art Nouveau architecture, is less than 5 minutes away. Every room is individually designed and comes with a TV and a minibar. There is a table and a chair. And hairdryer, as well as free toiletries in the bathroom. Many restaurants are short walk away from the hotel. 6 private parking spaces are available at extra cost. Breakfast is included in the price with all the rooms. Free Wi-Fi is available in all of the rooms and in the lobby. Small and cosy family-owned hotel short tram ride away from the Riga Old Town. Or you can also walk, because it’s still at most just half an hour away from the old town. Read our guide to Riga to learn more about public transportation in Riga! The Augustine Hotel features a garden, where you can relax on warm and sunny days. Breakfast is included in the price of the room. An electric cooker and a fridge can be used upon request at no extra cost. And a Finnish sauna is available upon request, too. Free parking and free Wi-Fi. Standard rooms as well as family rooms are offered, in case you are traveling with children. A 3-star hotel 5 minute tram ride away from the Riga city center and the old town. Hotel is located on the left bank of the river Daugava. Most of the others I’m mentioning here today are located on the other bank, but it alone doesn’t make this location any worse. Apart from the fact, that you need to cross the bridge to get to the city center. All of the rooms feature free Wi-Fi, TV and private bathroom. There is a desk in the room, where you can work. And in the bathroom you’ll find free toiletries. The OK Hotel has an air conditioned restaurant, where you can try Latvian cuisine. There is also an open-air cafe in the courtyard. Private parking is available at no extra cost. And breakfast is included in the price also with the standard rooms. 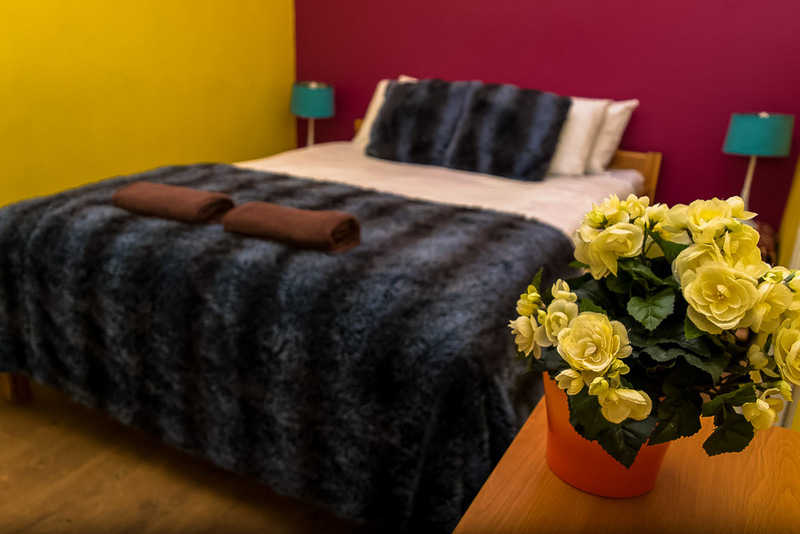 Located in the the Riga Old Town – most central location in the city – Naughty Squirrel Backpackers Hostel clearly is one of the best options, when you are looking for affordable accommodation in Riga. Yes, it’s a hostel (one of the very best hostels in Riga), but they offer private rooms as well. And, according to booking.com, couples like this place a lot as well. You can either choose a room with an attached or shared bathroom. Or if you are on a more tight budget, take a bed in a dorm. 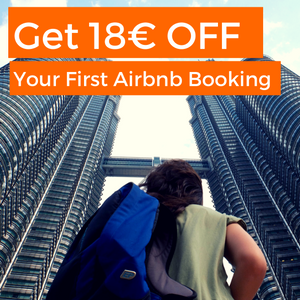 Beds start at 11 EUR/night. 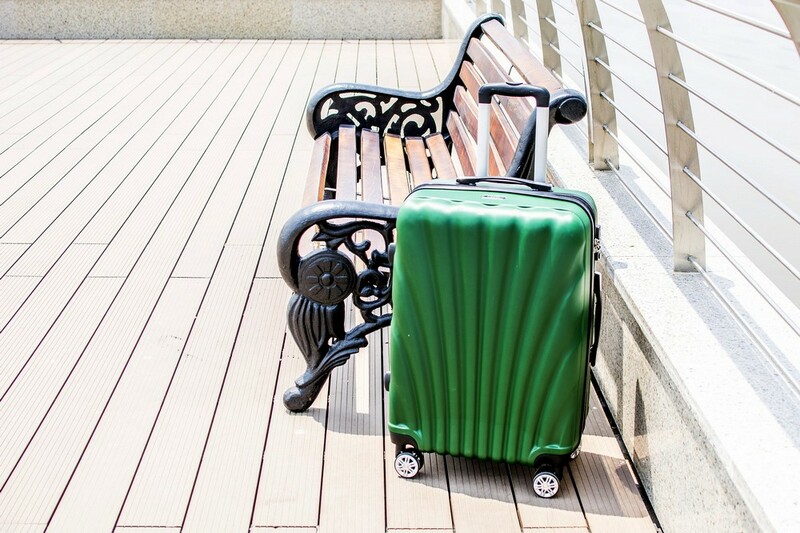 What else – free luggage storage (also after checkout), free tea and coffee all day long, unlimited high-speed WiFi. And another great 3-star hotel on the left bank of the river Daugava, housed in a 100-year old Art Nouveau building. 5 minute tram ride away from the Riga Old Town. All rooms at the Primo Hotel are with hardwood floors and each has a TV and a private bathroom. Some of the rooms has a bathtub in the bathroom. Breakfast is included in the price and they have a breakfast menu with up to 30 choices. There is free on-site parking available for guests of the hotel. Located in the heart of the Riga Old Town Hotel Radi Un Draugi is a great example of how affordable are also the best hotels in Riga. It’s a 4-star hotel with an average guest rating close to 9/10 (on booking.com). Well, ok, rest of the hotels in this list are also about the same as well rated. Why to stay in the Riga Old Town? It’s the most central part of Riga and, in my opinion, also the most beautiful. Each one of the rooms at the Hotel Radi Un Draugi has tea and coffee making facilities, safe, TV and modern bathroom with a hairdryer. Free Wi-Fi is available in every room. Buffet breakfast is included in the price. And it’s being served in the hotel’s restaurant. The hotel also features a lounge room and a cafe – bar, serving a variety of cocktails. If you were curious – name of the hotel “Radi un Draugi” in Latvian means relatives and friends. Situated on the left bank of the river Daugava the Rixwell Elefant Hotel is a good option, if you don’t really care that much about staying in the city center. And it’s also great choice if you want to stay close to the airport. Riga International Airport is only about 5 minute drive away from the hotel. At the same time, getting to the Riga city center and Riga Old Town isn’t a problem. You can use a public bus or taxi. For taxi I recommend you to get the Taxify app (similar to Uber and Grab). 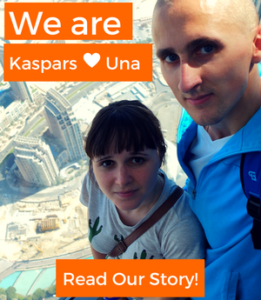 Use code KASPARSM7X and you’ll receive 7 EUR discount for your first ride. Apart from being a really nice and modern 4-star hotel the Rixwell Elefant Hotel gives its guests access to a fitness center for free. There is also a restaurant (with kids menu as well) and an ATM on site. Parking at the private parking of the hotel, though, will cost you extra. A 4-star boutique hotel located in the old town, close to the Dome Cathedral. All rooms at Hotel Justus feature a safe, a minibar and a TV. Bathroom, of course, is attached and there you’ll find a hairdryer and complimentary toiletries. There is also a sauna in the hotel, where to warm up and relax after walk around the city. The hotel’s restaurant serves both Latvian and international dishes. Breakfast is included in the price of the room. 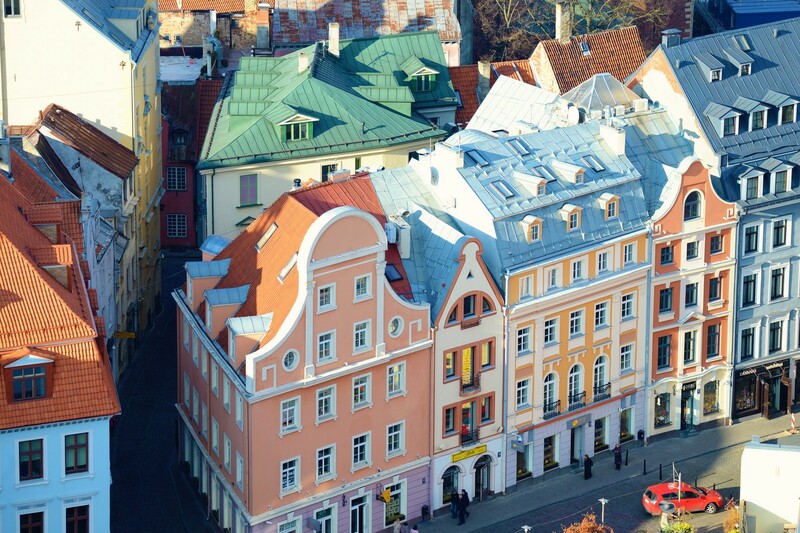 A 4-star hotel with a character, located just a quarter mile from the Riga Old Town. Rooms at Europa Royale Riga are spacious. Each one of them has a large sitting area, safe and work desk. The Europa Royale Riga hotel features also a sauna and hot tub. And there is a casino in the hotel, too. Car and bike rental service is being provided at the hotel. Just ask at the reception! A well rated 4-star hotel in the Riga city center. Equally close to the old town and the Art Nouveau district and the Alberta street (only about 5 minute walk away). All rooms at the Radisson Blu Elizabete have large TVs, safe, work desk and electric kettle. The hotel features a sauna and fitness center. And there is a bar and restaurant at the hotel as well. Restaurant serves organic food and specializes in grilled dishes and South American cuisine. If you are making a booking on booking.com and if you would like to have a breakfast at hotel, make sure to choose the right option! Otherwise you’ll have to pay 18 EUR for breakfast. 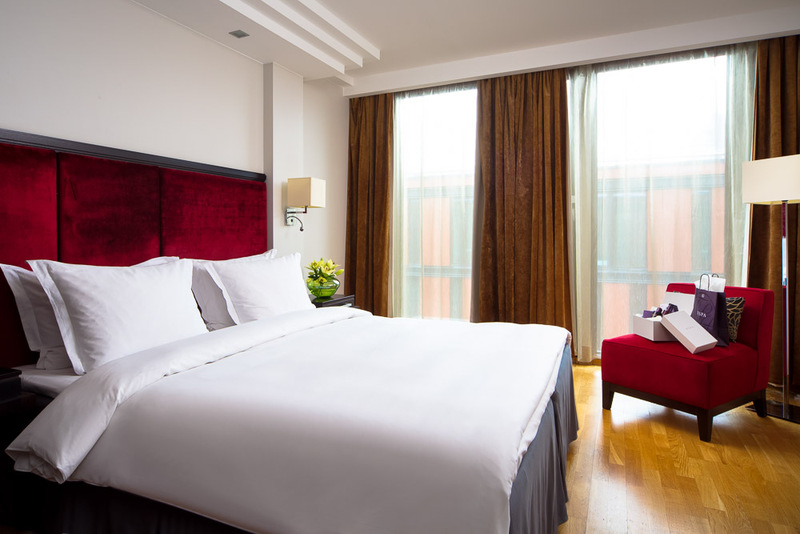 A 5-star boutique hotel short walk away from the central bus station and train station, and the old town. All rooms at the Bergs are spacious and features a bathroom with heated floor and both a shower and a bathtub. In every room you have a washing machine and a minibar. There is a car rental service, massage parlor, bar and a restaurant on site. Guests of the Hotel Bergs also have a free access to the gym and sauna. Free Wi-Fi is available throughout the building. And one more extremely well rated Radisson Blu hotel in the Riga city center. 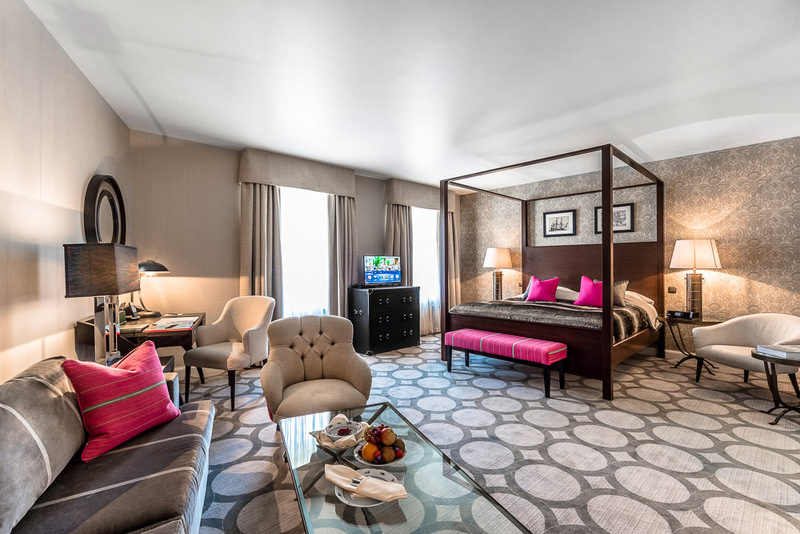 The rooms at Radisson Blu all are classically furnished and feature a sitting area, a table and a minibar. There is free Wi-Fi in all of the rooms. If you like working out, you’ll enjoy the on-site fitness center with a panoramic view of the nearby park. And the gym features not only the latest cardio and weight-training machines, but also a sauna and a steam bath. The same as with the Radisson Blu Elizabete, if you would like to have a buffet breakfast at the hotel, make sure to choose the right option when making a booking on booking.com. Located in the heart of the old town the Grand Palace Hotel is one of the best rated 5-star hotels in Riga. Contemporary design rooms of the Grand Palace Hotel feature a safe, minibar and flat-screen TV with radio. Bathroom has heated floors. The latter is a nice feature to have if you are traveling to Riga during autumn, winter or spring. There is a great on-site restaurant, serving international dishes from Europe and Asia, and a bar with an extensive cocktail menu. The spa area of the hotel features a sauna, a steam bath and a 24-hour gym. Located in the heart of the city the Pullman Riga Old Town is my personal favorite among the luxury hotels in Riga. The hotel is set in a historical building – horse stable – dating back to the 18th century. But all of the rooms are modern design and stylish. Apart from all the amenities and features you may expect at a luxury hotel there is also a swimming corridor, 24 hour gym and sauna with a view of the Bastion Hill park. A 5-star hotel in a prime location, a walking distance away from most of the Riga’s top sights. All rooms at the Dome Hotel have a TV, minibar, safe, electric kettle and Nespresso coffee machine. 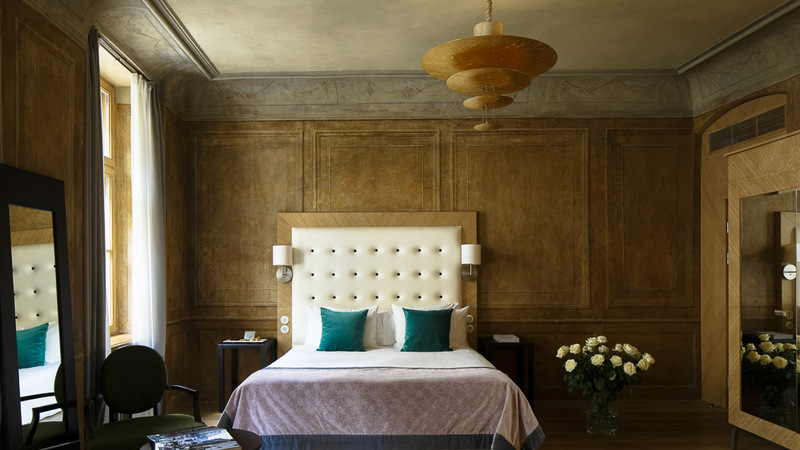 All of the rooms are individually decorated and feature king-size beds. Each has custom-made furniture. SPA complex is located in the same building, and guests of the hotel have a free access to it. The gourmet breakfast is included in the price. I hope this article will help you to find the best hotel in Riga for your needs. In case, you still have some questions about Riga or Latvia, check out our other articles about Latvia here!